NEWS ITEM ON HURRICANE NICOLE ISSUED BY THE BAHAMAS DEPARTMENT OF METEOROLOGY FORECAST OFFICE SECTION, AT 6PM TUESDAY 11TH OCTOBER 2016. AT 5:00PM EDT, THE CENTER OF HURRICANE NICOLE WAS LOCATED NEAR LATITUDE 27.4°NORTH AND LONGITUDE 66.4° WEST OR ABOUT 350 MILES SOUTH-SOUTHWEST OF BERMUDA. NICOLE IS MOVING TOWARD THE NORTHWEST NEAR 5 MPH. A NORTHWEST TO NORTH-NORTHWEST MOTION IS EXPECTED TONIGHT. A TURN TOWARD THE NORTH AND AN INCREASE IN FORWARD SPEED ARE EXPECTED WEDNESDAY MORNING, FOLLOWED BY A NORTHEAST TURN LATE WEDNESDAY. MAXIMUM SUSTAINED WINDS HAVE INCREASED TO NEAR 80 MILES PER HOUR WITH HIGHER GUSTS. ADDITIONAL STRENGTHENING IS FORECAST DURING THE NEXT DAY OR SO AND NICOLE IS EXPECTED TO BECOME A MAJOR HURRICANE BY LATE WEDNESDAY. 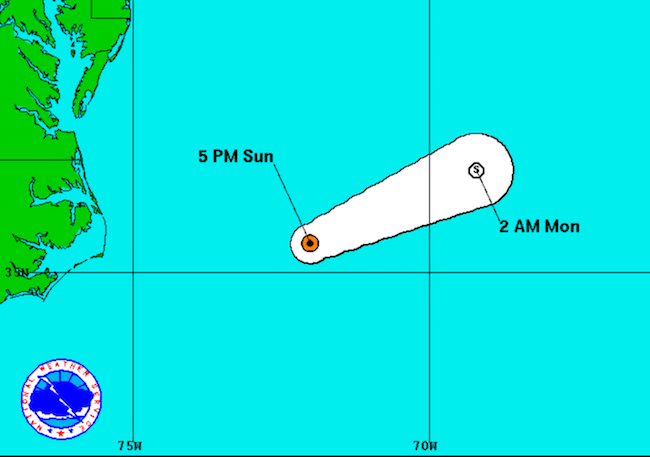 NICOLE POSES NO THREAT TO THE BAHAMAS AT THIS TIME. THE NEXT NEWS ITEM WILL BE ISSUED AT 6AM WEDNESDAY.